A variety of VoteLynx components and accessories are available to maximize the benefits of the system in your facility. Shown below is a partial list of available components. Please contact Intent Digital for a complete list. MiniTouch Vote Panels: simple touch based voting operation with the VoteLynx XLG Meeting Management System. Available in either flush mount or desktop styles. Features small diagonal LCD touch display for voting, request to-speak and microphone control. Click here for more info. 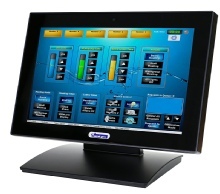 MiniTouch Vote Panels w/Microphone: simple touch based voting operation with the VoteLynx XLG Meeting Management System. Available in either flush mount or desktop styles. Features 3.5” diagonal LCD touch display for voting, request to-speak and microphone control. Click here for more info. Graphic User Stations: enables members to view agenda documents, make motions, enter votes, request to speak, control a microphone and view media presentations. Speaker timer and real time clock are also displayed on the screen. Click here for more info. MiniTouch Vote Panels w/Microphone and Audio: simple touch based voting operation with the VoteLynx XLG Meeting Management System. Features 3.5” diagonal LCD touch display for voting, request to-speak and microphone control. Click here for more info. 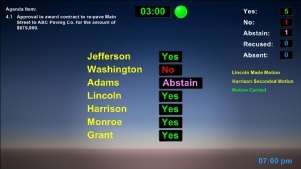 Graphic User Station Software: Displays agenda items, member motions and votes, timer count, real time clock, vote results on video displays and broadcast systems. Click here for more info. Video Display Unit: Displays agenda items, member motions and votes, timer count, real time clock, vote results on video displays and broadcast systems. Click here for more info. Timer LCD Displays: VoteLynx timer displays show minutes & seconds count. Large red, yellow, and green indicators indicate start, stop and wrap-up cues. Click here for more info. Touch Panels: Several touch panels are available for managing request to speak, audio visual control and other functions. Graphical layout and control functions are user configurable. Click here for more info. 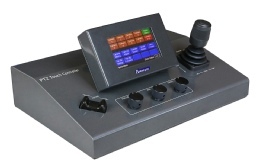 System Controllers: Small format unit contains Ethernet, serial ports, USB and video connections. Manages VoteLynx and audiovisual control functions. Also available as a request to speak controller. Click here for more info. 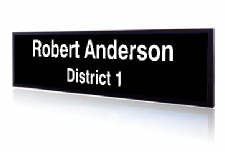 Member Name Displays: Ultra-wide LCD displays mount in front of each member to show names to audience. Click here for more info.